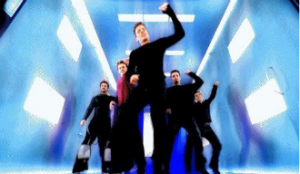 What better way to celebrate the holidays than with one of our favorite boy bands of yore? That bubbly piano intro, the layered vocals—even the “God sends you his love” line that feels awkward and out of place in a non-Christian rock song—all of it comes together for *NSYNC’s cheesy but irresistible jam. “Merry Christmas, Happy Holidays” is the type of song that screams “1998” while also smacking you in the face with festive cheer and warm wishes. While it’s still catchy, you have to admit the buoyant beats (not to mention the gang vocals at the end) feel a little dated. But it’s hard not to smile (or laugh) into your eggnog when you hear it. If, like me, you hadn’t heard Issues until the first time you listened to Punk Goes Christmas, you may have been fooled into thinking they’re a boy band with that jangling piano intro and singer Tyler Carter’s falsetto. That misconception lasts for about the first twenty seconds of their cover…until the drums and throbbing guitars come in. Then the unclean vocals in the chorus lead into a heavy second verse, and you realize Issues is pretty much the opposite of a boy band—even though Carter’s pipes wouldn’t be out of place on a pop album. Issues somehow manages to make the *NSYNC song less cheesy and more modern, and I’m into it.